Looking to cut the cost of a new kitchen? Whether you're planning a new kitchen from scratch, want to update an existing kitchen or are adding a kitchen extension, it’s important to establish your budget before you consider how you want the finished space to look. This will stop you from viewing, and falling in love with, options that are out of your price range. It’s important to remember that wanting the best value for your money doesn’t mean opting for cheap alternatives that you’ll be unhappy with in the long run. It simply means making sure every penny of your budget goes towards a kitchen you’ll be happy with. Use this advice to use that budget wisely and cut the cost of a new kitchen. Then hop to our guide to planning, designing and budgeting for a new kitchen to find out more. You can use our guide to planning the perfect kitchen extension for a bigger project, too. ‘Most kitchen renovations start with the old kitchen going in a skip, but if you want to keep costs to a minimum, think about what’s saveable,’ says experienced renovator Jason Orme. ‘In many cases the carcasses can be reused and, with a bit of work and new doors, will look as good as new. Worktops – particularly if they are solid granite or quartz – can be recut, saving you hundreds of pounds. ’If you have too few units, you may be able to buy more, or opt to use them on just one wall. Alternatively, consider using old units if you are planning a utility room. Use our guide to choosing the best types of kitchen worktop – we take you through all the material options and finishes. Just because your old kitchen is no longer to your taste, doesn’t mean it is scrap. If you’re not reusing existing materials such as floorboards, doors, radiators and units, they can be sold. Try Ebay, Gumtree or contact your local reclamation yard. Reducing wastage will also reduce costs for skip hire and disposal. Bear in mind, too, that you can dispose of waste at your local council tip for free, whereas tradespeople will have to pay. Remodelling and reusing existing space can solve many of the frustrations you have with your inherited kitchen. ‘Modern requirements for utility rooms, drying rooms and even larders can often be satisfied by making use of what’s already there,’ says Jason. Find out more about extending a house in our essential guide. No one will ever know if your kitchen once stood in a showroom and you paid a bargain ex-display price. ‘If you’re extending, there may even be scope to design your space to suit an ex-display kitchen – and if you’re not, then the company will usually be able to add/remove a few units to make the kitchen work in your space,’ says Michael. End-of-line appliances, sourced online via specialist distributors, can also be real bargains. ‘Unless it is an essential to radically alter the orientation or usability of a kitchen, try to keep the sink, dishwasher and cooker in the same position if costs are an issue,’ says Jason. ‘That way, you’ll be minimising the amount of additional electrical, gas and plumbing work that is needed to realise the new design – and save hundreds of pounds into the process.’ And, if you can, avoid having to move your gas and electricity meters, as they cost £1,080-£1,320 each to relocate. It can be all too tempting to fall in love with a beautiful showroom kitchen without checking that it offers the best value for money. ‘The more you can plan ahead, the more chance you’ll have to shop around,’ explains Jason. ‘The cost of kitchen units, worktops, doors, taps, sinks and cooker hoods varies wildly and if you can wait for sales and spend time researching prices you can save £1,000s on the total cost.’ Consider shopping with online-only retailers, which don’t have the same overheads as companies with showrooms and can therefore keep costs down, but always check reviews and ask to see samples of everything before you order. Or, go for a ready-to-paint kitchen and paint the kitchen cabinets yourself to save money. Alternatively, if your kitchen carcasses are sound, shop door-only options. Installation of the kitchen itself can be a key contributor to cost – typically installers estimate £50 per 60cm element, plus extras, meaning a typical kitchen can easily cost £1,500 to £2,000 to install. You can cut this cost by installing the units and doors yourself from flatpack, which any medium-skill DIYer should be able to manage. It’s also relatively easy to tile walls using online tutorials as a guide. But always leave worktops and the electrical and plumbing elements to the professionals. Finding the right companies and tradespeople to work with could save you thousands, with even the same kitchen varying in cost from different builders. 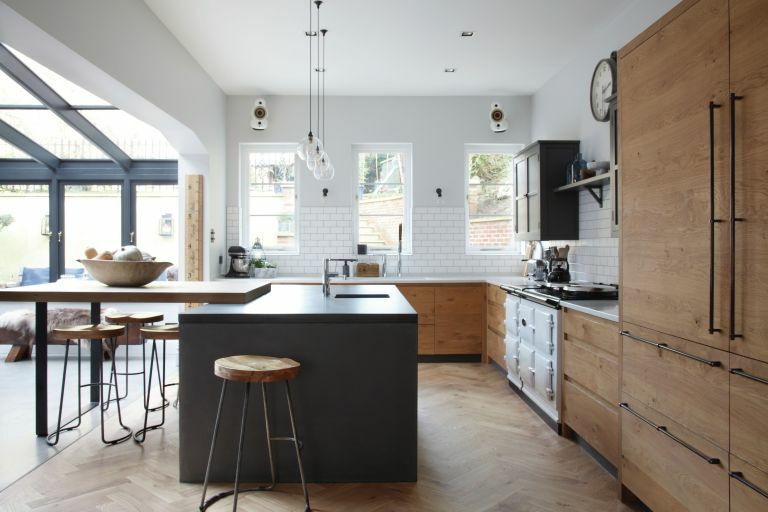 Most kitchens come in set styles – for instance, Shaker or handleless units – so, once you’ve chosen the look you want, get quotes from at least three different kitchen companies or fitters to ensure you're getting the best deal. Remember, the cheapest may not be the best if not all of your requirements are met. Follow the same process with plumbers, electricians, tilers and, if needed, installers, to ensure best value for money. Always ask for references from past clients and, if possible, visit homes where they have completed similar work. Finally, always get a written, itemised quotation so you know exactly what you will be paying. Use our guide to find a good builder – and find out how to avoid cowboy builders.